Bird Box or Bird Brain? 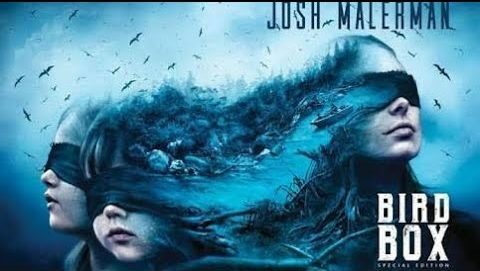 Bird Box, a movie based off of the book Bird Box by Josh Malerman, has flooded the nation and will leave you asking some questions. Bird Box was directed by Susanne Bier and produced by Chris Morgan, Clayton Townsend, and Scott Stuber as a Netflix Original, which is a film specific to Netflix. It is set in a world where vision could be the death of you. The entity or “monster” takes the form of your worst fears, but no one else can see it. Malorie Hayes, played by Sandra Bullock, must embark on a journey down the river to get herself and her children, Boy and Girl, to safety while being blindfolded the entire time. With hearing everyone’s opinion and reading many reviews I decided to take time and watch the movie myself. I agree with the rough 5/10 star rating most people are giving the movie. I believe that the acting was great; Sandra Bullock did an amazing job showing the progression of Malorie Hayes as a character growing from not wanting her own child, to loving and doing everything to protect them both. The “monsters” were never shown throughout the entire film, which I do believe contributed to the downfall of the movie even though the “monster” was specific to the individual person seeing it. There was no explanation as to why there was an outbreak of the “monsters” and mass suicides, so it leaves you asking questions as to why this happened. As a whole, I do believe Bird Box is a decent film; however, I wish it would have been executed better and given the viewer more answers.